"A Giant Game Of Bumper Cars"
The split tribes reunite at Lavita beach, buzzing about the sixth vote cast in a five-person tribal. Kellyn confesses immediately to throwing two votes on Laurel. Oh boy, it’s the “looooove” episode. This used to be a good idea, back when we actually got to know more than two or three of the contestants and it was fun to see them interact with people outside of the game. 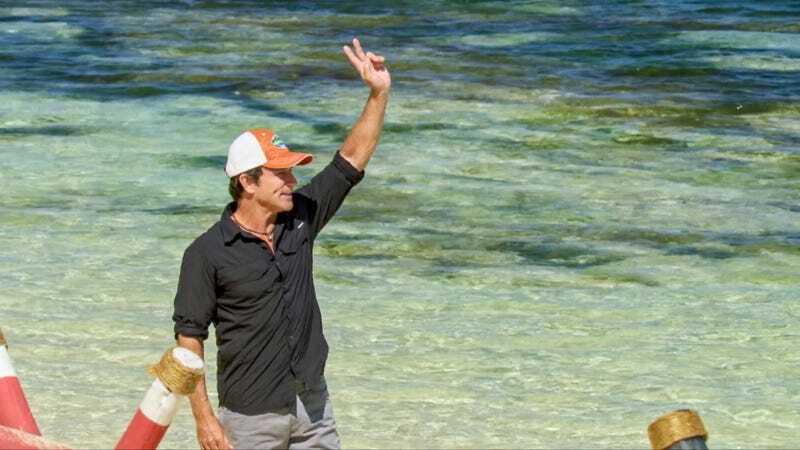 These days, though, it’s all about Jeff Probst milking the emotion for all he’s worth. “Why is love so important right now?” “What does your father mean to you?” “Are you proud of your emaciated, mud-encrusted daughter?” Let’s see how it goes this time. Wendell’s pop is also named Wendell. Tears! Even though Wendell is big and strong! Can you imagine? Kellyn’s brother is pretty quiet. Donathan’s Aunt Patty lets him know his mom and grandmother are fine. Angela’s daughter Paige is used to being away from her, so it seems like this shouldn’t be a huge deal. Chelsea, who I’m not sure has ever had a confessional, greets her sister Sidney. Laurel’s brother Frank is her rock. Seabass has a little sister named Grace. He thinks she’s pretty. She’s his sweetheart. Let’s move on. Dom’s wife Kristin is not blood. He chose her, Probst says, although I’m hoping she had some say in the matter. She’s in agony every day he’s away. They don’t let the family members participate in the challenge anymore, which is lame. It’s a balance beam/sandbag toss deal, and Seabass beats Dom in the end. He picks Dom, Wendell, and Donathan to join him on the reward, leaving the four women out of luck. There’s a Ghost Island twist! An advantage definitely awaits, and Wendell gives up his time with Wendell Sr. to grab it. Wendell claims the second chance challenge advantage Malcolm had in Philippines, plus he gets to practice balancing the ball. Dom assures Aunt Patty that he’s committed to Donathan, who isn’t so sure he’s on board with the big guns anymore. The four women discuss pulling Donathan in to take down the dominant Dom/Wendell alliance. Laurel knows Dom and Wendell both have idols, so she’s a little nervous about the plan. Wendell needs that advantage, but it doesn’t help much. THE CURSE IS STILL IN EFFECT. It comes down to Dom and Donathan, with Dom prevailing and throwing a monkey wrench in the women’s plan. Wendell and Dom are gunning for Chelsea. The women shift their target to Wendell. Donathan and Laurel are “settin’ pretty in the middle.” At tribal council, Donathan says there is an opening for him and Laurel, which stirs up a bit of panic. Chelsea says it’s a giant game of bumper cars, raising the number of memorable things she’s said this season to one. Time to vote! Wendell doesn’t play his idol. Smart move, it turns out, as five votes go to Chelsea. To say we hardly knew ye would be an understatement. She was...good in challenges. I’m not really sure how she got cast, though. Anyway, Donathan and Laurel still have the opportunity to team up with Angela and Kellyn next week, but with Dom and Wendell still holding idols, they better hope Seabass doesn’t win immunity.